In an effort to maintain good stewardship of the community’s facilities and replace dilapidating equipment, Casa María has acquired a new, commercial-grade mop to be used exclusively for the dining room and kitchen. 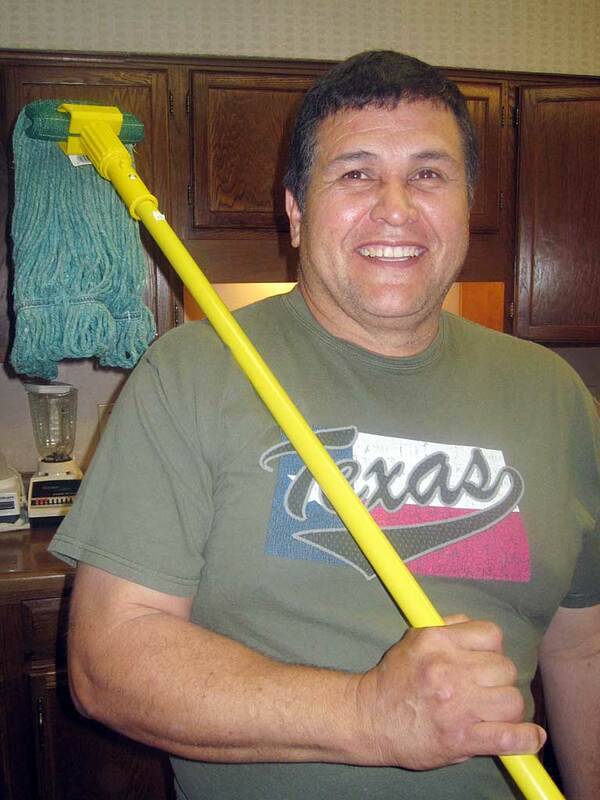 Brother Dennis, head of the Office of Temporalities at Casa María, purchased the mop at Cleaning Ideas, shortly after his morning shopping run was completed at HEB Marketplace, Tuesday, May 18. “The Pardos [Casa María’s cooks] suggested it was time to replace the old mop with a commercial-grade one so I went next door [to the HEB] and got one,” Brother Dennis recalled. To celebrate this occasion, Brother Bob, head of the Office of Religious Life at Casa María, suggested that it would be appropriate to plan a formal blessing of the mop on a Friday morning, while reciting Psalm 51—Create in me a clean heart and a clean kitchen. This entry was posted on May 18, 2010 at 6:15 pm and is filed under Community News. You can subscribe via RSS 2.0 feed to this post's comments. Both comments and pings are currently closed.